Ultimately, you’re the one who has to make the final decision between the two, but we can help you along the way. From pricing to demographics and matching processes, below is all the information you need to decipher if Match or eHarmony is the way to go. We spend all day every day testing dating sites, reviewing dating sites, writing about dating sites, reading about dating sites, and pretty much every other thing that has to do with dating sites. OK, maybe we don’t do this all day every day, but you get the idea. We’ve spent years covering this industry, and that includes Match and eHarmony. So we can understand why you might be having trouble deciding — they’re the best of the best! With 4.9 out of 5 stars, Match is damn near perfect. The site has been around the longest (since 1995), has millions of members and growing (30 million and 13.5 million visitors a month), has free and affordable subscription options, has helpful online features (e.g., Reverse Matching) and offline features (e.g., singles mixers), and has paired more singles than every other dating service. We’ll bet you know someone who’s tried Match or know someone who knows someone who’s tried Match. The point is, Match.com was the first site on the online dating scene, and it’s been a pioneer and household name ever since and is here to stay. We’d compare eHarmony and Match to burgers and pizza. Both are extremely good — they’re just different. It all depends on what your mood is. In terms of eHarmony, the site is a great alternative to Match for many reasons, which include its one-of-a-kind matching test and dedication to singles with typically traditional values. You’ll notice we gave eHarmony 4.5 out of 5 stars, and there are a couple of components that play a role in that. First, if you want to search for your own dates, you won’t be able to do that here. However, if you want most of the work taken off your shoulders, then eHarmony is a good fit. Second, eHarmony is just for straight men and women, while Compatible Partners, a sister site that’s nearly identical, is for gay men and lesbian women. This means you won’t have to do a lot of weeding through incompatible profiles. Who Has It All? Match! We have to give our overall round to Match, and it’s easy to see why. It’s hard to find something wrong with the site. This isn’t to say you shouldn’t consider eHarmony — you’d really be happy with either. But you should weigh the pros and cons based on your needs before jumping in. It doesn’t matter if you want a free online dating experience or don’t mind spending some money on it — Match has both routes. The site’s free membership never expires. With it, you’ll be able to fill out your profile, add numerous photos, browse singles, and receive matches and messages. However, you won’t be able to do certain things like send messages. If you’re on the fence about Match, your best option is to sign up for the free three-day trial, which will let you test absolutely everything. If you already know you want to go with Match, you can get 74% off on any premium membership by clicking the link below. Or you can click the trial link. These two options include browsing and messaging (with no limits! ), Email Read Notification, Highlighted Profile (appear at the top of the site’s search results), First Impressions (your profile will be sent to new users), and matchPhone (talk with matches on a private line). The highest price Match offers as of right now is $26.99 a month for three months. But, with the discount above, you’ll end up spending way less. You won’t be able to communicate with your matches, but several times a year (usually around the holidays), eHarmony has free communication weekends. This is the time to go crazy with your messages and try to meet your matches in person to see if the chemistry is really there. Another thing you could do is go ahead and register for a full subscription, which will give you access to Guide Communication and Secure Call, among other features. The highest price on eHarmony as of right now is $29.95 a month for three months, but you’ll save a ton with the deals we have. Plus, you can always cancel if you don’t like it, and you won’t have invested too much. For 73% off, use the promo code DATINGADVICEBBB, and for 60% off, use the promo code DATINGADVICEAAA. eHarmony and Match are very comparable in terms of price, but Match has the slight edge — thanks to the $26.99 a month membership (vs. $29.95) and 74% off discount (vs. 73%). Hey, saving every penny adds up, right? This seems like an obvious thing to say, but when you’re on a dating site, you want to be around people you’re going to like, date, and, eventually, fall in love with if that’s your end goal. It doesn’t matter if the site has 1 trillion members — if they aren’t your type, you’re probably not going to have success. In this section, we’ll take you through the demographic breakdown of Match and eHarmony. A recent article in the New York Times says Match is at 30 million users, and we expect that number is only going to increase. Match is one of the largest and most inclusive online dating sites, with 30 million members ranging in age, location, race, religion, and sexual orientation. These users are located in more than 25 countries and vary widely in age, sexual orientation, ethnicity, appearance, and lifestyle. When you’re filling out your profile, you can select all of the characteristics and traits that are most important to you and sort users using those filters. Match will also use this criteria to handpick potential dates for you. While Match is inclusive in some aspects, the site could do a better job in regards to bisexual and transgender singles, but that should be on the horizon soon. With 33 million users in over 150 countries, eHarmony beats Match by a hair in this category. However, as we mentioned earlier, eHarmony is strictly for heterosexual daters. Lesbian and gay daters will have to turn to Compatible Partners if they like eHarmony’s process. In addition to the differences in the sexual orientation of its member base, eHarmony’s users also tend to lean slightly older and female (52% vs. 48%) than Match’s, and a significant number are Christian. Even though eHarmony does have the numbers on their side, Match is our go-to for having a more inclusive environment where singles of different sexual orientations don’t have to use separate sites. Now let’s get into how eHarmony and Match actually find you your future dates and/or partner. Both sites are leaders in the technology department and are constantly adapting their process to improve the user experience. Without a doubt, one of our favorite services Match offers is the six-month guarantee. If you don’t find a true match (not just someone the site recommended to you who you thumbs down) within six months, you’ll get the next six months free. Perhaps the thing eHarmony is most known for is their unique questionnaire, which was founded by Dr. Neil Clark Warren (a clinical psychologist, Christian theologian, and seminary professor), consists of 150 questions (answer as many or as few as you want), and could take about an hour (if you’re feeling talkative that day). eHarmony has a questionnaire — consisting of 150 questions — that digs deep into what singles truly want in a match. This site uses this test to compare 29 dimensions of compatibility, such as values and beliefs, between yourself and the other members to give you the most accurate matches. It goes beyond surface-level stuff like what your favorite movie is and what types of food you love. And, according to Men’s Health, more than 15,000 people fill out eHarmony’s questionnaire every day. eHarmony’s matching system is definitely impressive, but Match takes the cake for us, particularly because you’ll have a happy medium between getting help from the site and being able to take matters into your own hands. Match launched in 1995, and with such as established history, they’ve been able to create billions of connections, millions of dates, relationships, marriages, and even babies. That’s more than every other dating site on the web. Barrett and Shauna’s love story is just one of thousands that have happened because of Match. And the site keeps stacking up the numbers as dozens of success stories come in on a regular basis, including Barrett and Shauna. As a pilot, Barrett was always on the go and had trouble meeting someone special, so his friend told him to try Match. Shauna messaged him two days later, and, as fate would have, she was a flight attendant who understood his busy schedule. Their first date lasted for six hours, their courtship lasted for about nine months, and we’re sure their marriage is going to make it all the way. eHarmony was founded in 2000 and since then has been the reason behind 4% of marriages in the United States. Some other stats worth mentioning are that eHarmony’s divorce rate is 3.86% (the national average is 50%) and over 542 people get married on a daily basis because they met on the site. You can read more mind-blowing statistics about eHarmony here. This was a difficult decision, but Match does have five years on eHarmony and, therefore, has been able to get more success stories under their belt. The odds are in your favor on either site, though. Match Took Every Round, But eHarmony is Still a Top Choice! We’ve reached the end of our Match vs. eHarmony battle royale, and, drumroll, please… Match is our champ! The site has almost everything you could ever think of going for it, but eHarmony.com has a lot going for it, too. So back to the initial question. 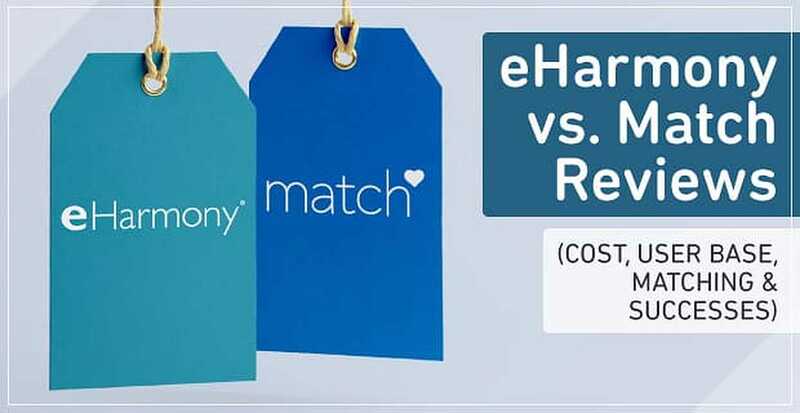 “Is Match better than eHarmony?” It honestly all comes down to what price, audience, features, and type of connection you’re looking for. Good luck in your decision-making, but we think you’ll be happy no matter what!